Raymond Miranda went to the US to study industrial psychology and he lasted all of one semester. He got involved in theatre and started to learn scriptwriting. Although he was more passionate about this, one corner of his brain thirsted for more. “I was this weird guy who was into theatre but would also sit in the library and read the Harvard Business Review and not understand why I was so fascinated by that world,” he chuckles. It did not become clear until 10 years later, when he married the two sides of his personality to start his company, Labora[s]tory Sdn Bhd, which helps businesses find their central narrative. “I don’t think I could have done what I am doing now 10 years ago. Although that was when I really started thinking about storytelling in business,” says Miranda. He graduated from New York University (NYU) in May 2001 and was there when Sept 11 happened. “My dad died soon after. So, a lot of things were happening. My dad had been diagnosed with schizophrenia some years before. After Sept 11, things became very stressful for me and I felt I was stuck in a country that was not letting me out because I would not be able to come back in. I think the height of my stress arrived and I was beginning to see that I was struggling to hold an image of myself in clarity,” he says. It terrified him. He wondered whether he was following in his father’s footsteps. “So, I did thousands of mind maps. One of the things about schizophrenia is the inability to hold a singular story about oneself. It is a fragmented story all the time,” says Miranda. But even while he slowly unravelled, he held it together and taught scriptwriting to his students at NYU. “From there, I gained a deep appreciation for the fact that what I was actually teaching was storytelling. I also had a deep appreciation for what stories do to the human being. If you cannot hold a single story inside you, it fragments your entire life,” he observes. This led him down the path of neuroscience. He read everything he could get his hands on — “a really wide variety of things about fragmentation and what it does”. He made a video about this time in his life. It is sort of a marketing video for Labora[s]tory, but it speaks of the fragmentation and disruption to life as it is and the power of a cohesive story to bring it all together. “Data can persuade us, but a story can fire the imagination and stir the soul,” says Miranda, who bared his soul for the camera and made about 1,000 mind maps and stuck them all over the place. “Those years were just sort of ... I do it rather poetically in the video, but they were clearly very painful years. Doing the video was very tough because I don’t think my family knew that whole chapter. Miranda felt it was pivotal for him to talk about why he went into neuroscience and why he started dabbling in parts where the story gets fragmented and how it is critical to the way he understands stories and the way he teaches them now. “I knew that truth was vital to the strength I would bring to organisations,” he says. Right now, we are dealing with story overload. “The rate at which we experience stories is so phenomenal now that nothing sticks. We have fantastic movies and stories that keep coming, just so many of them. And nothing organises our lives. Whereas before, stories were meant to create meaning and to organise,” he says. This approach tends to stick in his craw. “I just had this argument with a company. I said my methodology is not so you can get more money. As great as your product is, my methodology is to help you understand how story is used within your organisation to transform it and, therefore, create a trickle-down effect,” he says. But what is his methodology? “There are several principles to a great story. For one to start, a ritual must be broken,” says Miranda. “So, if you are watching a husband and wife sit down to have breakfast, you know that the movie has not started because it is normal. And if the movie goes on for 10 minutes of this, we get bored and we shut down. And then the principle of homeostasis kicks in, where everyone conspires to bring back the ritual so that everything can go back to normal. “So, when young people have dreams, or when people say they want to start a company, by and large, they will fail. The percentage of failure for companies is very high — about 90% — because the world conspires to go back to the norm,” he says. Miranda studied this structure and looked at organisations. “Nobody understands that the innovation process, the dreaming process, the entrepreneurship process is first you announce you are going to do something and then everything works against you,” he says. Personally, he does not think the map is all that special. “It is the way we use the map in organisations that is special. And that is the distinction,” says Miranda. Labora[s]tory only started last December. Nevertheless, the world is hungry for what he has to offer — maybe not in Malaysia yet, but he has already attracted international interest. 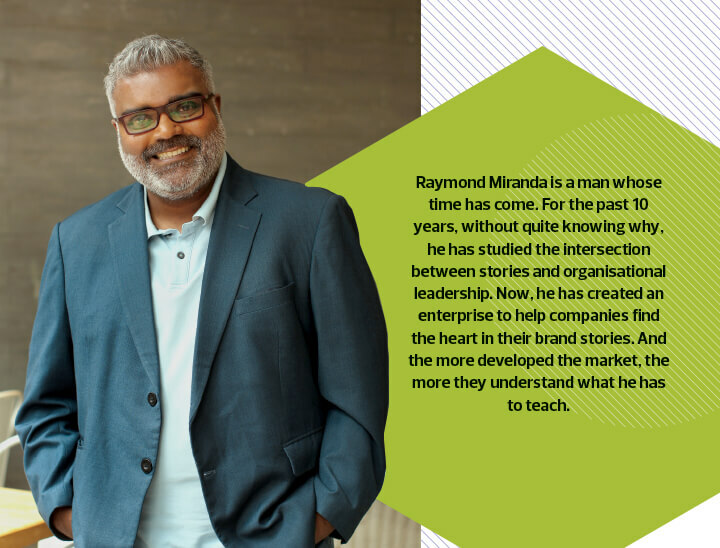 For instance, Miranda was invited to present his concept at the highly prestigious CIO 100 Symposium (for chief information officers and senior IT and business executives) in India. “There were 120 CIOs from 10 industries. I introduced the theory, gave them the principles and had them do an exercise and follow the map. That was the most frightening experience for me because I had never worked with 10 industries simultaneously,” he says. Although Miranda struggles with explaining what he does to companies that think it is just another gimmick to help them sell products, he remains optimistic. “If the researchers at Oxford University are right, automation and artificial intelligence (AI) will take over 47% of the jobs. And the jobs that will survive are in the creative and social intelligence fields. These jobs exist in places that call us to be more human,” he says. When he was in India, reporters asked him who would win in the man/machine fight. “We will absolutely win if we realise that the machines will beat our current level of intelligence. But they will not be able to beat our current level of empathy,” says Miranda. The fight comes down to how we create stories. “The one thing that distinguishes us from the other creatures in the world is that we are story-making, meaning-making creatures. So, I am optimistic about what this means for us as AI, deep learning and all those things challenge our levels of intelligence. Our survival will depend on innately human characteristics,” he says.